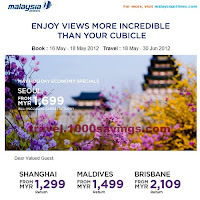 Browse » Home » Shanghai » MAS : Big for May 2012 - Unbeatable Economy and Business savings - SEOUL, SHANGHAI, MALDIVES, BRISBANE and many more! 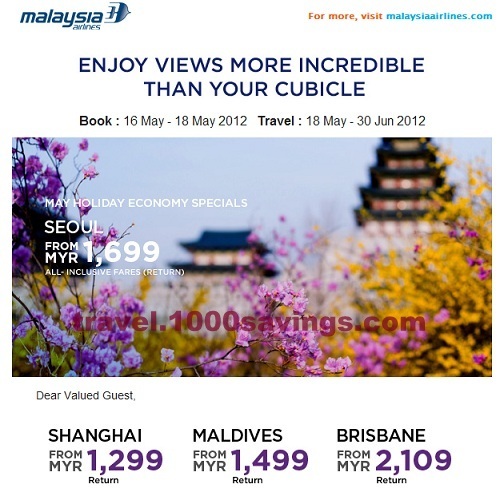 MAS : Big for May 2012 - Unbeatable Economy and Business savings - SEOUL, SHANGHAI, MALDIVES, BRISBANE and many more! Price includes airfare, airport tax, fuel surcharge, insurance and administrative fees. Price listed is correct as of date of publication and may be subject to change due to fluctuations in exchange rate, airport tax, fuel surcharge, insurance and administrative fees. Airport tax is subject to revision from time to time by the relevant airport authorities. Fares are not applicable during peak periods and are subject to seat availability. Other terms and conditions apply. Do you like MAS : Big for MAY 2012 promotion?